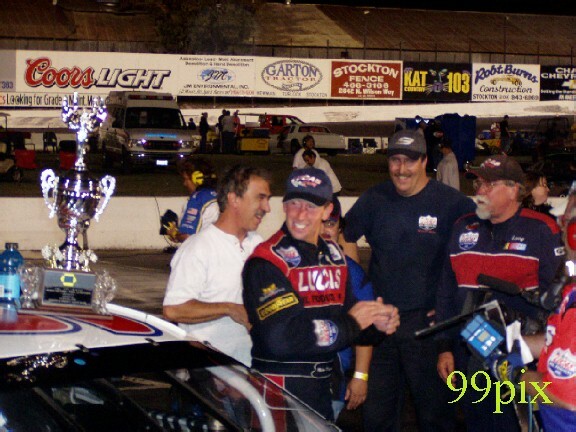 STOCKTON-- John Moore started at the back of the field and still won the Western Late Model main event at Stockton 99 Speedway. But all the talk after the race was about a valve spring. Moore's engine has a valve spring that is different from those in other engines, and it became a controversial car part. Moore says he's done nothing wrong, and for now the track officials have agreed with him, although there will be more tests on the car. Moore won his sixth main event of the season in front of a crowd of more than 4,000 fans, but said the post-race controversy didn't make him happy. "I didn't do anything wrong, and they are welcome to check my engine as much as they want," Moore said. "I am upset about this though. I won, and some people couldn't beat me on the track. They are being poor sports." Stockton driver Gary Shafer Jr., #3, who finished in second place, said he just wants everything to be fair. He asked for the engine to be checked after his team heard that Moore's engine had a different valve spring. "It really isn't anything personal against John, but there are rules," Shafer said. "My stance is that if it's illegal, it's illegal." Moore and several other drivers use what is called a "spec motor," and the engines are supposed to be built the same. Officials did check out Moore's car, and deemed the part different, but not illegal. "They looked at it and said that the valve was different than others, but it didn't give John a competitive advantage," Stockton 99 general manager Pat Patnaude said. "So we OK'd it and the results became official. But we will check it out." Moore will bring the car to the shop of engine builder Tony Otto in Fairfield today for further testing. "I have no problem with it, because I want to put this behind me," Moore said. Moore trails Pete Anderson Jr., (left), of Stockton by nine points in the battle for the WLM title. 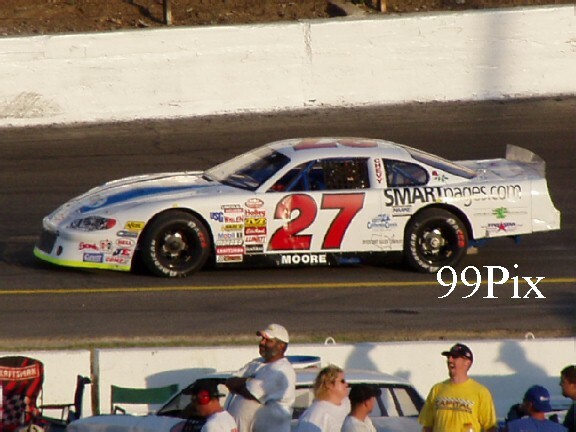 Moore was penalized during his qualifying runs because his tires were deemed illegal, and he was forced to start in the 11th position. STOCKTON — Mike Duncan crossed another goal off his list Saturday. The Bakersfield driver, who finished second at Stockton 99 Speedway the last three times the Grand National West series came to the track, finally won. He claimed his second consecutive victory by leading the last 20 laps, holding on through three caution flags. It was Duncan's fifth win in the series. "It was a nerve-racking feeling knowing there was a last-lap restart," Duncan said. "Everyone wants that last lap. God, it's exciting." Before the West race, Granite Bay's John Moore unofficially won his sixth Western Late Model main of the season, holding steady at second place in the standings. Moore's car was still being checked after a protest was filed. If the finish held, Moore would still be nine points behind Stockton's Pete Anderson Jr. (820-811) with three races left. Chad Holman won the American Limited Stock Car main ahead of Modesto's Charlie Clawson. Duncan beat former Oakdale resident Steve Portenga, #16, on the Lap 186 restart. 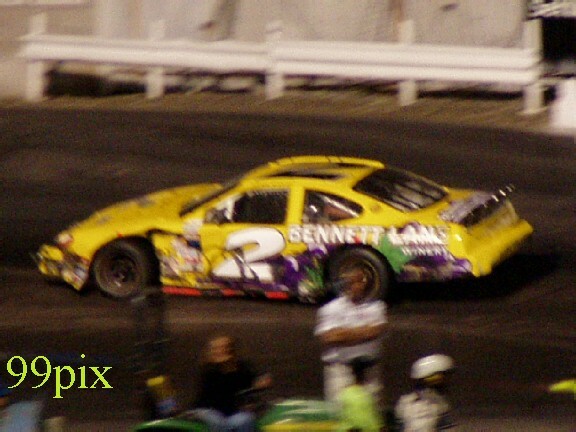 He held on after two more caution flags and a run by Scott Lynch to win in 206 laps. A caution flag on Lap 199 when Modesto's Mike David hit the back wall extended the race for a green-flag finish. Lynch, who won at Stockton earlier this year and whose crew chief is Manteca's Robert Strmiska, finished second. 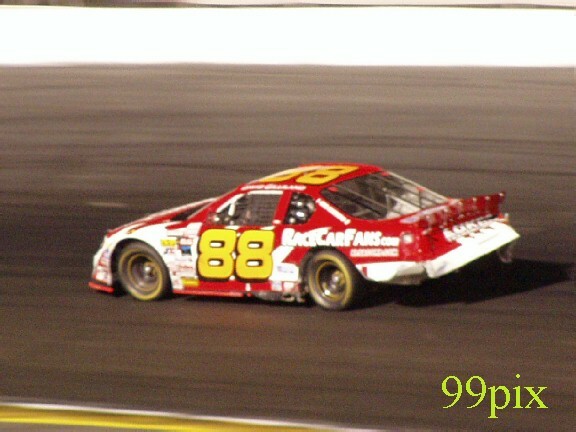 Portenga, who led 95 laps, was fourth behind #88, David Gilliland. Duncan entered the night trailing Lynch 1,009-961 in points. "We're not gaining a lot on Scott, but we're hoping to continue it," Duncan said. "I knew we had a good race car. In practice, I said it was real racy and it showed tonight." Duncan admitted to being "pooped" after 70 laps of green flag racing in the second half of the event. There was a 10-minute halftime after 100 laps for tire changes and repairs. David, #2, finished 10th on a rough night. He traded paint with Gilliland in Lap 178, fighting to get back on the lead lap while Gilliland was running second. David thought he gave Gilliland room inside, and the two got too close on the front straightaway. Gilliland spun out in Turn 1. David started sixth and was running in the top 5 in the first half. With four laps to go, he spun out when trying to pass Jason Jefferson and fell to 14th. "The luck continues, I guess, and we can't turn it. But we will," David said. His rough month carried on, including two street accidents, a banged-up race car in transit and a stolen shop fan. 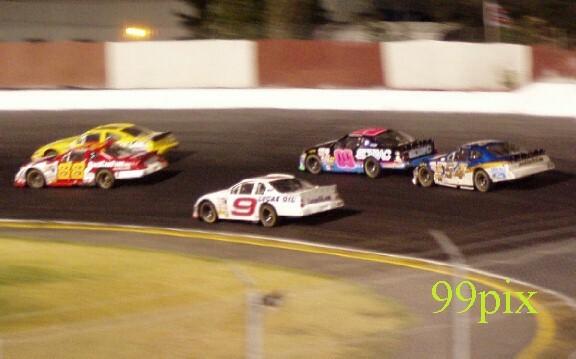 Gilliland entered the night third in points, Portenga third and David fifth. Tracy's Rick Ruzbarsky ended up 19th after getting sandwiched between two cars in Turn 4 of Lap 70. In the Western Late Model division, #27, Moore appears to be batting 1.000 when it comes to predicting victories. Though he won his sixth Western Late Model main event Saturday, it was only the second he had predicted. Moore said he had a good feeling about the night. He said his crew worked their regular jobs hard all week and only worked on his car six hours Friday night. Moore had to start from the back of the 13-lap field when his tires were deemed too soft by officials. He timed his final run correctly. A tight schedule due to Speed Channel taping cut the race short at 45 laps instead of 50. The time limit was set at 40 minutes. Turlock's #11, Chris Monez slid into the wall between Turns 3 and 4 in Lap 44, the result of a broken joint behind his right front tire. He remained in fourth place in the standings. 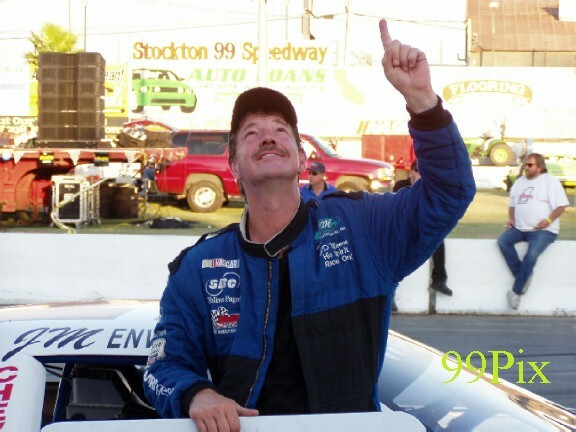 The finish was unofficial as of 11 p.m.
STOCKTON -- Mike Duncan finally won at Stockton 99 Speedway. 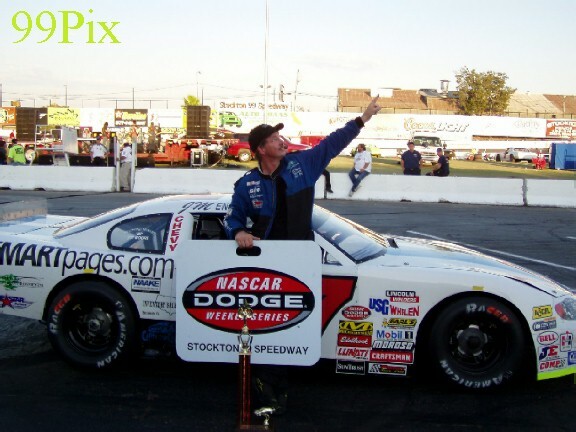 After finishing in second place in the past three NASCAR Grand National West races in Stockton, Duncan took the lead late in the event and won the Dodge Country/Napa Auto Parts 200 in front of an announced crowd of 4,000 which also watched a rock concert and listened to legendary crooner Pat Boone sing the National Anthem. In the co-featured event, John Moore of Granite Bay took the checkered flag in the Western Late Model main event. 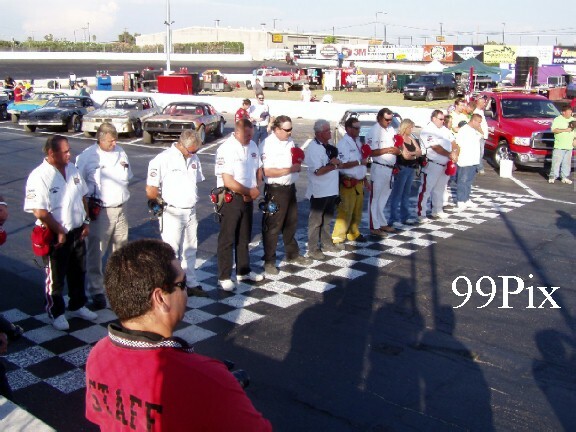 Track officials checked Moore's engine because a protest was filed, but upheld the victory. 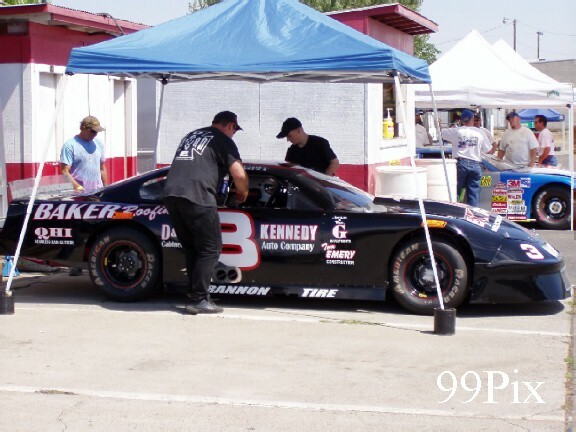 Duncan, a 43-year-old driver from Bakersfield, did not have to wait for officials to check his car to claim his victory and the winner's purse of $7,191. He took the lead from Steve Portenga of Sparks, Nev. on lap 186 and had to go 206 laps because of a late accident and caution period. "It feels great to win here, and anytime you win in this series or any series, you know it can be the last time," Duncan said. 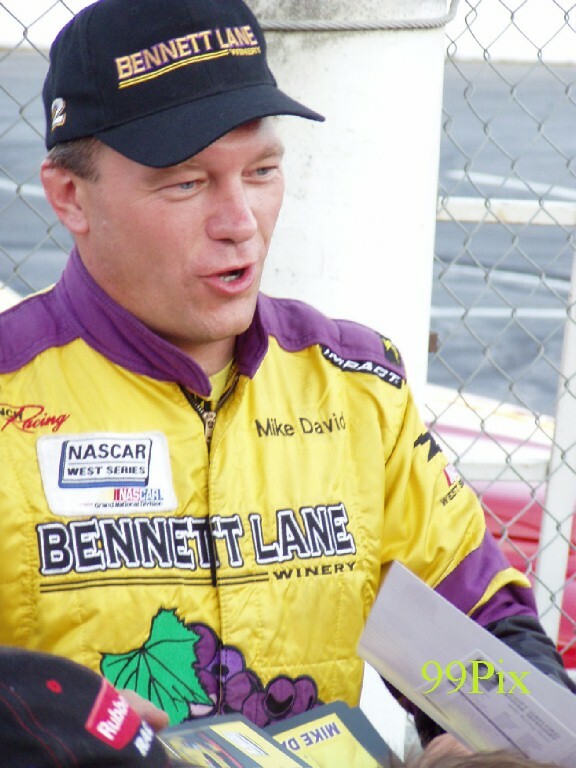 Duncan won the last Grand National race in Monroe, Wash. on July 30. Saturday, he had to avoid several accidents as the race turned into a messy affair which had nine caution flags for 61 laps. 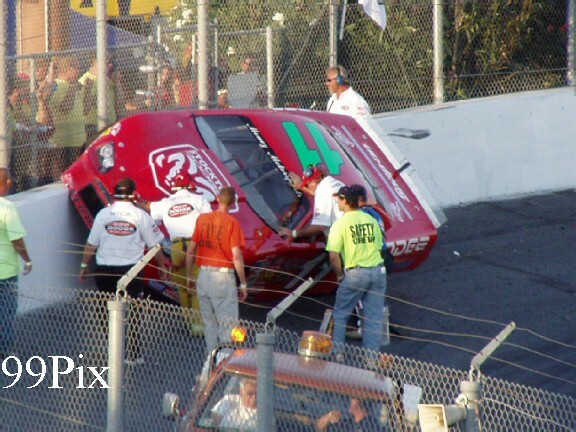 The final yellow flag was on lap 199 because of an accident involving Mike David of Modesto and Bret Thompson of Jerome, Idaho. Duncan beat Scott Lynch of Burley, Idaho on the final restart of the race. Lynch won the Grand National race in Stockton on April 30 and led the first 61 laps on Saturday before falling to 12th because of a dead battery. After the break at 100 laps to service the cars, Lynch moved up to second. Boone, 71, was in town to promote his song "NASCAR Time" from his new CD "Ready To Rock," and to support the Ryan Foundation, an organization he created which is dedicated to victims of head injuries. His grandson, Ryan Corbin, suffered a serious head injury in a fall four years ago and is still in a hospital. Chad Holman of Stockton won his third American Limited Stock Car main event of the season.